Jeremy [Howlin' Wolf]: Tell us about your involvement in "DEEP IN THE DARKNESS" and one or two cool experiences you will take away from this project? Matthew Llewellyn: Writing for and recording with an orchestra is my favorite thing in the world. I feel very fortunate to have recorded two scores now with a pretty decent sized orchestra. It’s a rare thing these days and ultimately my goal is to show young filmmakers the power and emotion that an orchestra can bring to their project. On “Deep in the Darkness” I did almost everything myself including; composing, orchestrating, music editing, and recording session preparation. A couple of my friends helped me with part extraction (for the session) and score/parts proofreading. It’s definitely a satisfying feeling knowing I can survive that amount of work, haha. Jeremy [Howlin' Wolf]: With being involved in a great mix of film, television and game music, is it any different being part of a score for a video game than a film project? Matthew Llewellyn: Film and video games are actually pretty different in their approach. Big games like Assassin’s Creed IV: Black Flag can have around three to four hours of music when the average film has a little more than an hour (unless you’re scoring Lord of the Rings). In video games you’ll often receive a list of musical requirements such as “Three Minute Action Cue with Tribal Elements, High Intensity” or “Two Minute Pad, Low Intensity”. Game developers will implement the music into the game as you go so essentially you’re delivering the final version of a cue every couple of weeks. In film, it’s a constant battle to keep up with changing picture so that’s why music editors are essential to the process. The music editors change/adapt the cues you have written as the picture changes and if you’re recording an orchestra that’s typically one of the last steps of the process. Video games also have a ton of cut scenes (cinematics) which are tiny movies in between the gameplay and as the composer you will be responsible for scoring those as well. In my experience, they usually come after all of the gameplay music has been finished. Jeremy [Howlin' Wolf]: How did it all start, a career in music, who were some of your personal influences? Matthew Llewellyn: There are many serendipitous moments that have led me to where I am today ranging from my grandma taking me to the movies when I was a kid to going to concerts every other week growing up. I started playing classical piano at a young age and picked up the guitar when I was a teenager. I grew up as a math and science kid but when I was a senior in high school I got this crazy idea about going to a music college. Music had always been a huge part of my life but I only just realized I could potentially pursue it as a career. My parents and I flew out to Boston to visit Berklee College of Music and after about three seconds I was hooked. I immediately applied and was thrilled to see I had gotten accepted. When I first started Berklee I had it set in my mind that I would study Music Business/Management and Music Production/Engineering. By my second year, one of my roommates was already deep into the Film Scoring Program. I was amazed by the fact that his assignments consisted of writing music to film. I had an epiphany and realized that I could combine my two favorite loves, music and movies, and get a degree for it. I quickly declared as a Film Scoring and Music Business/Management dual major and the rest is history. My biggest influence is John Williams. I don’t think my music sounds anything like him but his level of craft and attention to musical detail is endlessly inspirational for me. I also love the work by Franz Waxman, Bernard Herrmann, Danny Elfman, Thomas Newman, and more recently Michael Giacchino. Film composer Matthew Llewellyn's musical repertoire is grounded in the traditions of symphonic music for cinema as well as the modern movie making experience. Llewellyn has been an integral member of composer Brian Tyler's team working on high profile projects such as IRON MAN 3, THOR: THE DARK WORLD, NOW YOU SEE ME, THE EXPENDABLES 2, and FINAL DESTINATION 5. Llewellyn composed additional music for the critically acclaimed video game FAR CRY 3 and Don Coscarelli's (Bubba Ho-Tep, Phantasm) film JOHN DIES AT THE END which premiered at the Sundance Film Festival in 2012. He also provided musical arrangements for the hit video games ASSASSIN'S CREED IV: BLACK FLAG, ARMY OF TWO: THE DEVIL'S CARTEL and CALL OF DUTY: MODERN WARFARE 3. 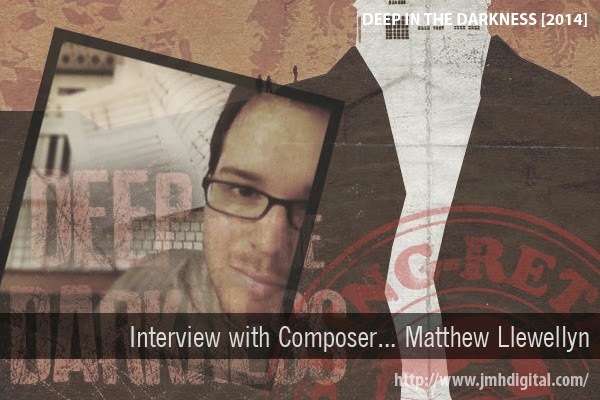 Recently branching out with his own composing career, Matthew Llewellyn has scored three feature films for the Chiller Network, a division of NBC Universal, including DEEP IN THE DARKNESS, DEAD SOULS, and REMAINS. His dramatic orchestral scores for DEEP IN THE DARKNESS and DEAD SOULS were both recorded with the Slovakia National Symphony Orchestra. The DEAD SOULS soundtrack was released in 2012 by Screamworks Records and MovieScore Media and his forthcoming DEEP IN THE DARKNESS soundtrack will be released by MovieScore Media in partnership with Kronos Records in May 2014. Matthew Llewellyn graduated from the Scoring for Motion Picture and Television program at the University of Southern California as well as receiving a Bachelors of Music degree in Film Scoring at Berklee College of Music. Born in California but raised in Minnesota, Llewellyn has played piano since the age of six and guitar from the age of fourteen. He also plays mandolin, bouzouki, ukulele and bass. For more information on Matthew Llewellyn, visit the composer's website at www.matthewllewellyn.com.